I loved reading as a kid. Weekly trips to the library and monthly ones to the bookstore were some of the highlights of my childhood. I still have a strong sentimental attachment to many of those books—so much so that I saved many of them and am now reading them with my own two children. However, when I look at those books from my childhood, what I see looking back at me are faces that look like mine; they are filled with white protagonists. Over the last six years, as we’ve developed a small library of Jewish children’s books in our home, I have noticed a similar trend. I recently mentioned to my 6-year-old son that it’s important for white children to read books with characters that are children of color. “Why is that, Mommy?” he asked. “Well, there are several reasons. First, the world is a big place and we live in and see only a small part of it. There are lots of people in the world whose lives and experiences are very different from ours, and if we only read books about white characters, our understanding of the world leaves out a lot of what the world is like. “Like the black soldiers in the Revolutionary War that we read about?” he asked. In language that he could understand, I was trying to explain to my son that the books we read reinforce subtle ideas we have about who is a Jew, the value of whiteness, and the lack of value of other cultures and communities and their realities. This combined with the pervasive silence in many of our white families around issues of race—out of understandable fear or anxiety or lack of certainty of how to begin—leads to the proliferation of these implicit, destructive racial understandings. It keeps our children from fully understanding the diversity and complexity of our world. 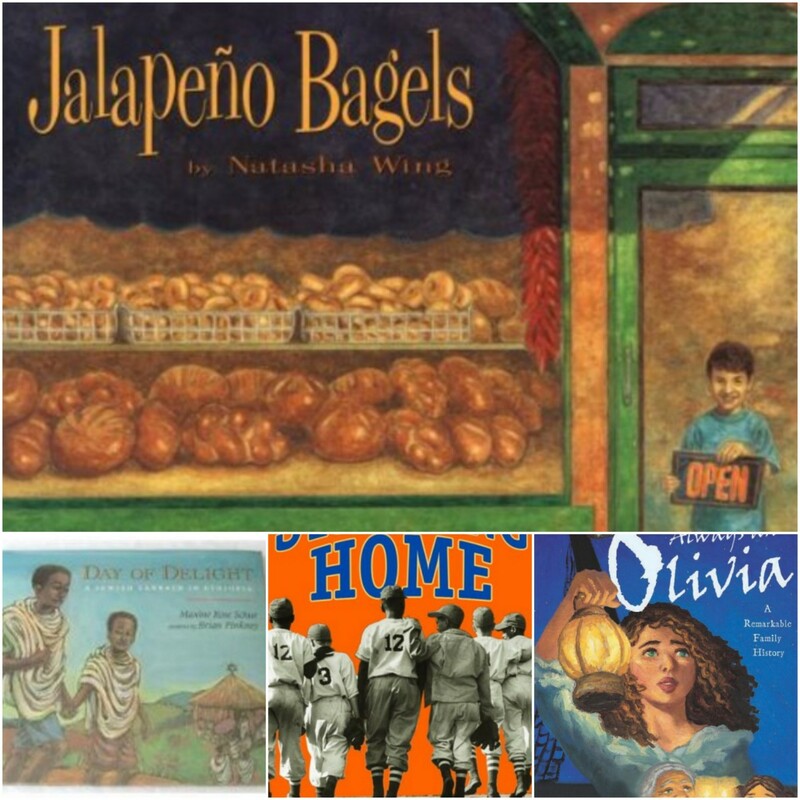 There is such great diversity within both the United States and the Jewish community, but when we look at the books our children read, they only show a small piece of that amazingly rich tapestry. But all is not lost! By exposing ourselves and our children to books where the main characters are not white, we can take on these implicit biases. A family story shared by a black grandmother with her granddaughter that spans generations and tells about the family’s Jewish heritage. A book, rich in images and details, that follows an Ethiopian Jewish boy as he and his family bring their daily work to a close and prepare for Shabbat. This story follows a family as they celebrate their son’s coming of age with ceremonies that mark this transition from both parts of his cultural heritage—Jewish and Native American. Isobel experiences her first celebration of the Hanukkah moon when her aunt moves from Mexico to live near Isobel’s family. The celebration includes a variety of new traditions that Isobel learns about. As part of a school project, Pablo discovers a food that represents both parts of his heritage—jalapeno bagels! Growing up in the Bronx, Joey loved baseball but because his skin was not as dark as the other kids, he was often excluded from their games. When his mother passes away, he goes to live with her white family in Brooklyn and discovers his Jewish heritage. This books explores the question in its title, challenging readers to understand that the Jewish community encompasses a great diversity of people from many different backgrounds and with many different skin colors. So, now you’ve added a few new books to your Jewish children’s library. Want to do more? Consider doing some research on the library at your local JCC, your synagogue, or your child’s day school. How many of these books do they have? Could you request a greater selection or donate a few to supplement their collection? There’s more to do to continue to break down the systems of racial prejudice that exist within our country at large and within the Jewish community, but this is a concrete step that all of us can take that has real, tangible impact.